SKINHELEP does not work for the artist AC/DC. Oh yes, forgot to fix that. It breaks because it has a / in the name which is also Kodi's default seperator for multiple artists. Will be fixed in next update but now there a hardcoded list in the code of bandnames with a / in the name. If anyone has suggestions, please tell me. Currently I only have AC/DC in the list but there might be some more to be added in the future. How about a "advancedsettings.xml" for skinhelper. So everyone can add own settings/artists/bandnames. How can I set it in the file advancedsettings.xml? (2016-12-08, 00:31)Saed Wrote: [ -> ] I think there is a problem in skin helper service, when I do a manual search, it generates an error. And then the kodi remains useless. I have to restart it. Looks like Tvdb was not available at the time you did that lookup. I've now added some error handling for to prevent a crash but it shouldn't happen that often. If you try again, will it work ? It is true happens very rarely, in fact almost none. Yes, this issue has been fixed some time ago but you're still on the old version currently. The version on Kodi repo will be updated within a few weeks. and rest of Airday info are always "Monday"
(2016-12-09, 04:09)Guilouz Wrote: [ -> ] I have a strange issue since last build with music widgets. When I press info on item (on home menu), I have info (plot and clearlogo) appear few seconds and disappear. No problem with video widgets. I can't reproduce this one. Sure you didn't change something in your skin at the same time ? (2016-12-09, 08:36)Solo0815 Wrote: [ -> ] How about a "advancedsettings.xml" for skinhelper. So everyone can add own settings/artists/bandnames. I think we're only talking about a very few artists to which this applies so I prefer not to add some more hacks to read a xml file and just add those artists to the static list in the code. Like I said, I have now added the most obvious one, AC/DC and please report more if you have more examples. No, but you might have some data in the cache. Delete the cachefile and try again. (2016-12-09, 14:14)JohnyBee Wrote: [ -> ] How can I set it in the file advancedsettings.xml? You can't. It was a request. What did you set as path in the multiimage ? Somehow it appends "logo/" to the result, did you do that ? 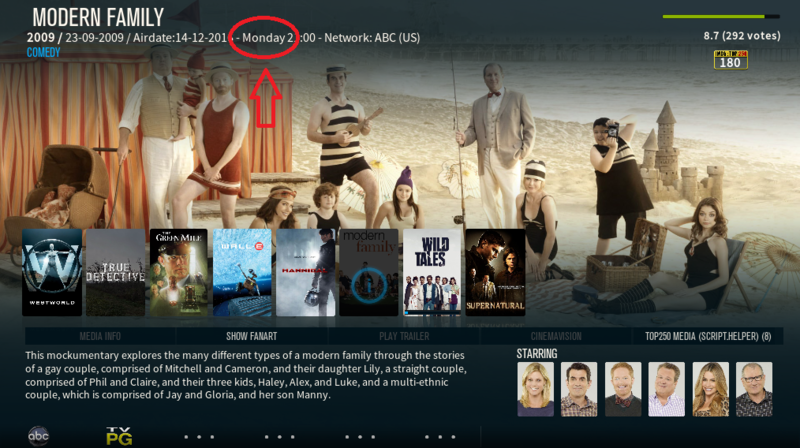 (2016-12-09, 01:15)marcelveldt Wrote: [ -> ] I can fix it so it will work again at group level but it's never ever going to work at the episode level with your PVR as there is no tvshow title in the episodes. If you want artwork at the episode level you'll have to figure out how to add the tvshow title in the naming. I can get art at group level now. Thanks! I'll be content with this until I find another PVR backend.